The Stott Site (DlMa-1) (Hamilton et. al. 1981; Badertscher et al. 1987; Tisdale 1978) was located by the landowner who uncovered cultural material while digging a cellar for his home. During subsequent text excavations, MacNeish (1954) discovered mounds on the upper river terrace of the site. He interpreted the site as an Assiniboine village. Reassessment of the site over the following decades has resulted in a substantial reinterpretation. Over the course of hundreds of years, during the Blackduck phase, Native peoples made intensive use of the area for bison hunting and numerous other subsistence activities. The Stott Site is located on the valley wall of the Assiniboine River near the present day city of Brandon. The river meanders through the aspen parkland and has cut a deep valley, creating oxbow lakes that support a wide variety of trees, shrubs, grasses and animals. At the time that the site was inhabited, approximately A.D. 1000, the climate would have been similar present day conditions with winter and summer extremes in temperature. Minor climatic shifts occurred during the time of occupation. The resources used by Native groups within the locality would have been susceptible to even these minor changes and may have resulted in alterations of the scheduling of seasonal rounds of resource gathering. Examples of changes in subsistence regimes as a result of these minor climatic changes include the fluorescence of horticulture during the warm and moist Neo-Atlantic, between A.D. 800 or 900 to 1250 (Syms 1976:36). The walls of the valley are terraced in a step wise fashion and are thickly forested with burr oak and ash trees and heavy lower story vegetation. The ground level vegetation is so thick it would be have been difficult to establish a camp on the terraces. Tisdale (1978:30) notes that the vegetation would have been trampled and browsed by bison in much the same way that the present day cows at the farm do resulting in a less tangled understory. The forested slopes of the Assiniboine River provided shelter from the cold in the and winter as well as from the heat in summer. The forested slopes supported deer, elk, small mammals such as mink, rabbit and beaver. The river itself was home to fish and clam, both of which are represented in the artifact remains. The archaeological remains at the Stott Site indicate that bison was the primary subsistence resource for the Blackduck inhabitants. Large herds would have congregated in the spring and fall and other resources, such as fish and migratory fowl, would have also been at peak abundance. Other, more scattered game animals included elk, deer, rabbit, muskrat, beaver, porcupine and small rodents. The occurrence of Blackduck on the prairies at the most westerly extent of their range illustrates the effective way in which they utilized multiple ecotones and resources. At the Stott Site the Plains subsistence pattern was adopted to harvest the herds of bison using the river valley walls as jumps. The thick bone beds attest to the vast quantities of bison taken at reoccurring intervals. The meat from the kill was butchered and processed here. A large percentage of the bone remains is broken and smashed, indicating the bone marrow was extracted and processed either for immediate consumption or was stored in the form of pemmican. The ceramic technology is distinctive of Terminal Woodland patterns. The Blackduck ceramic vessels are globular in shape with decorations applied to the lip, rim, and neck of the vessels. Generally, the decoration involves cord marks (the result of an object such as a stick being wrapped with cord and used to impress the clay), punctates, and combing or brushing. The vessels were used for heating food or for storage. The size, shape, and fragility of the vessels would have made them cumbersome to transport. The predominate lithic artifacts recovered at the Stott Site were tools or fragments of tools, or discarded pieces of stone resulting from the production of stone tools. Projectile points were recovered in abundance (in 1979 one hundred and five points were found). Avonlea, Prairie and Plains side-notched type points and Plains triangular type points were found at this site. The single Avonlea point was found intermixed with the later Prairie and Plains points. This occurrence suggests that there is not a distinct horizon separating the earlier Avonlea points from the later Plains and Prairie types (Syms et al. 1979:133). Other tools recovered that were associated with meat processing included end scrapers, side scrapers, bifaces, utilized flakes, drills and worked flakes, and cores. The stone tools were manufactured using a variety of types of material. Locally available cherts, chalcedony, quartz and quartzite were common among the tools and flake detritus. Non-local material included Knife River Flint. Seven small pit features with one or several bison bones positioned vertically within the V-shaped pits were located stratigraphically beneath the main bone bed layer. No artifacts other than the vertically placed bones associated with them. Features such as these have been reported at archaeological sites throughout the Northern Plains and have been reported at the Avery Site (DhLs-1), although no interpretation has been attempted. Badertscher et al. (1987) has investigated this feature further at other Plains sites and suggested several possible explanations. The bones may have been used to hold posts that were part of a bison pound, but at the Stott Site no associated post moulds were found. The bones may have also been used to fill in rodent holes so that people wouldn't step into them. Another interpretation posits that the features are the remains of bison drive lane markers. During the Terminal Woodland Period larger groups of people are believed to have cohabited for longer periods in response to the most efficient use of food resources. 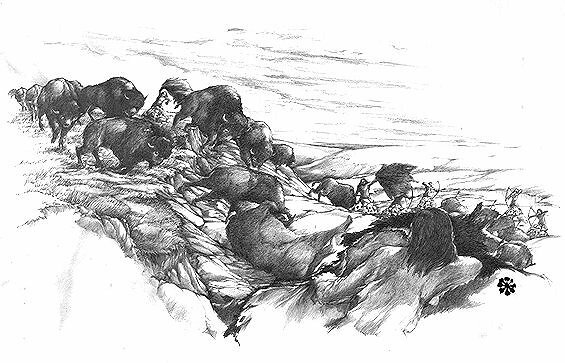 At the Stott Site, the method used to take bison required large numbers of people to dispatch the animals and process the large quantities of meat. The large physical extent of archaeological site reflects this mammoth undertaking. Multiple occupation of the site over hundreds of years contributes to its size but the numbers of people who resided here at one time must have been substantial. Numerous hearths were uncovered throughout the course of excavations but evidence shelters or dwelling structures were not recovered. Badertscher et al. (1987:280) identified a potential camp area within a cluster of artifacts that indicate a wide range of general activities including tool sharpening or manufacture and bone and hide working . The Stott site contains a significant indication of elaborate ritual practices and beliefs in the form of a prominent burial mound. It is located on the lip of the Assiniboine River valley and commands a spectacular view. The nine burials found within the Stott Mound were associated with grave goods and were initially considered to be representative of a Blackduck occupation (MacNeish 1954:21-30). However, radiocarbon dating on the skeletal material from the mound places it earlier than the accepted initial dates (A.D. 800). In addition, no artifacts were recovered from the mound that can be definitely identified as Blackduck (Badertscher et al 1987). Badertscher (et al 1987) compared the burials with two "classic" Blackduck burial mounds (McKinstry Mound 2 and Osfusen Mound both in Minnesota) and found that there were very few similarities. The Stott Mound contained two distinct burial pits, one of which contained the remains of 2 individuals and the other, 5. Grave goods included bison skulls, beads, clam shell, ochre, and copper. Remains of a canine were recovered in a separate pit. Since the burial was evidently not associated with Blackduck, Badertscher et al (1987) looked at the non-Blackduck ceramic remains for clues about potential links with other groups. Sherds that were identified during an earlier excavation as St. Croix Stamped may hold the answer. This ceramic ware has been found throughout central Minnesota and northward along the Red River valley possibly into Manitoba. This distinctive style of ceramics was found in the Arvilla Complex burial mounds on a tributary of the Red River in North Dakota. Like the Stott Mound burials, the Arvilla Mound burials in North Dakota contained bison skulls, copper, and beads (Badertscher et al 1987:348).